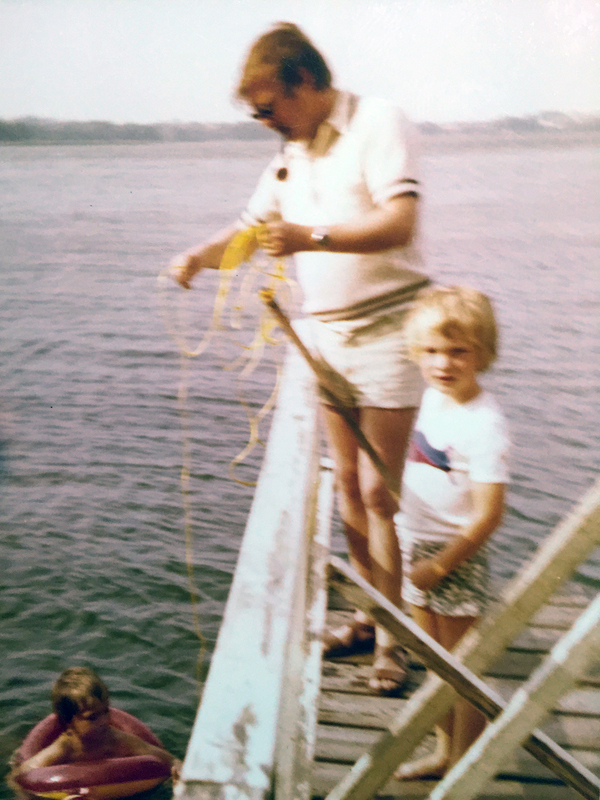 Today our father would have been 80 years old. He was born on the 23rd August 1935. He died seventeen years ago in 1998 at the age of 62. Too early. He smoked pipe tobacco for as long as I knew him and in the late 90s it finally caught up on him. 1998 was probably the most bizarre year in my life. Thinking of him I sat down and typed my dad’s name into Google. I didn’t expect much to find since he died during the early stages of the internet. In 1998 I had just used email for a short time and I did my first EBAY transactions. It was far past 98 before the internet really made it into Germany. People who lived prior to the internet had their lives archived in boxes, not on social platforms. But to my surprise I found three things. 1. One was a business website that just lists people’s job positions at companies. Nothing new here. 2. I found one website called Genealogy.net, which looks into family trees. They didn’t find a tree but to my surprise there are people out there, who photograph and catalog gravestones to track family names. So I found a photo of my dad’s gravestone. Strange world. 3. The third find was the most interesting one. Back in the 60s my parents lived for three years in Birma, now Myanmar. When the country collapsed and turned into a dictatorship, they moved to New Zealand and lived there for another three years. 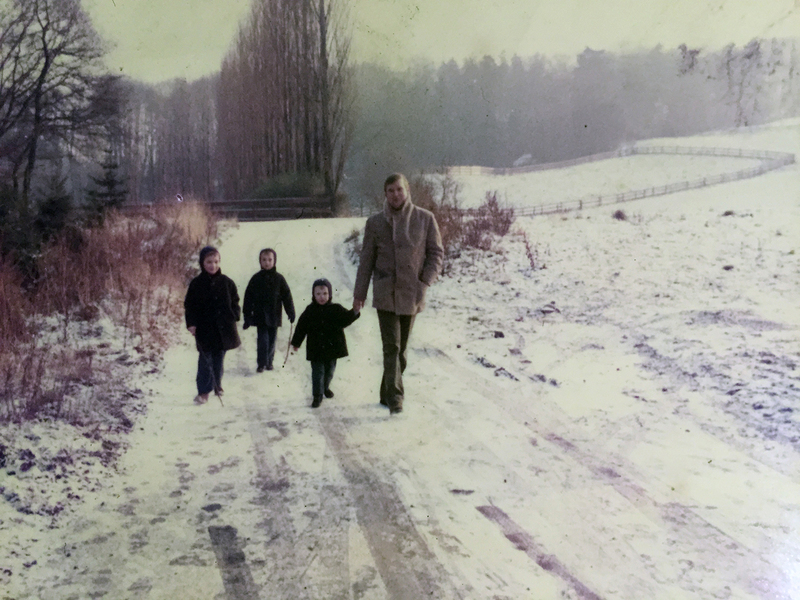 My dad worked for Bayer and it was a privilege for young people to get out of post-war Germany and see the world. 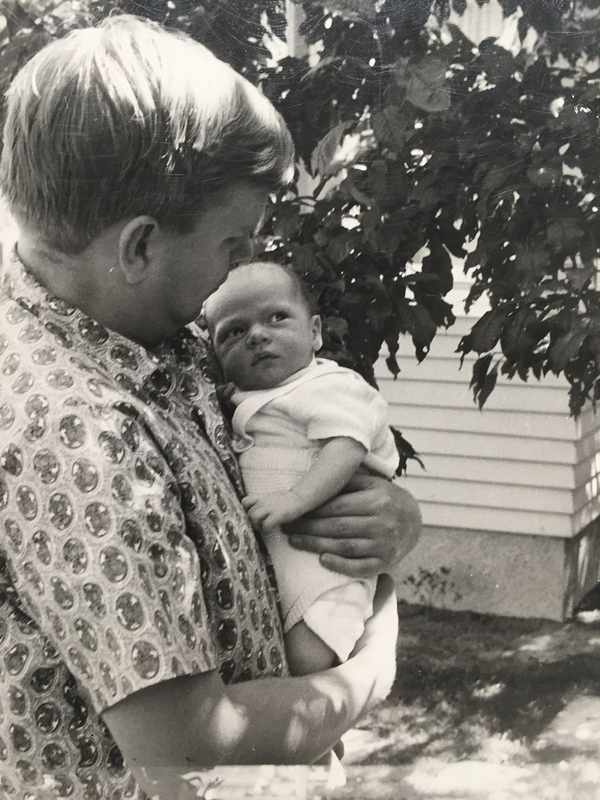 While my oldest brother was born in Germany, right in between living in Birma and New Zealand, my second-oldest brother and I were both born in New Zealand. After three years living at the end of the world, without good communication, initially no heating, and at a time when flying was basically first-class only, we embarked a ship in summer of 68 to get back to Europe. This was a six week journey on board of a vessel called Achille Lauro. A ship, that through its entire service was followed by disasters. Here are some details from Wikipedia. • On 6 January 1953, Willem Ruys collided in the Red Sea with running mate MS Oranje. Th MS Orange was badly damaged. • In 1965 it had an onboard explosion, which lead to a renovation of the ship. Now sailing under the flag of the Flotta Lauro Line, it was named Achille Lauro. Its main voyage was the route between Southampton and Sydney, Australia and Wellington, NZ to bring new immigrants to the world in the southern Pacific. • In 1972 is suffered a disastrous fire. • A 1975 collision with the cargo ship Youseff resulted in the sinking of the latter. • Another onboard fire in 1981 took her out of service for a time. • In October 1985 the Achille Lauro was hijacked by the Palestine Liberation Front. The attackers killed the jewish-American passenger Leon Klinghoffer and threw his body overboard. • In November 1994 the vessel cought fire after an explosion in the engine room. It sank two days later near the coast of Somalia. In 1968 my family bought tickets for the tourist class to sail from Wellington to Southampton to then travel back to Germany. From what I heard this was not a fun trip. Tourist class was not really a serviced class. Most of us got sea sick for weeks. Every morning my mom had to make her way to the kitchen to get milk for us and to do laundry of the bed sheets. Picture being with three young kids on a six-week, self-served boat trip. When I googled my dad’s name I found a website called familysearch.org. 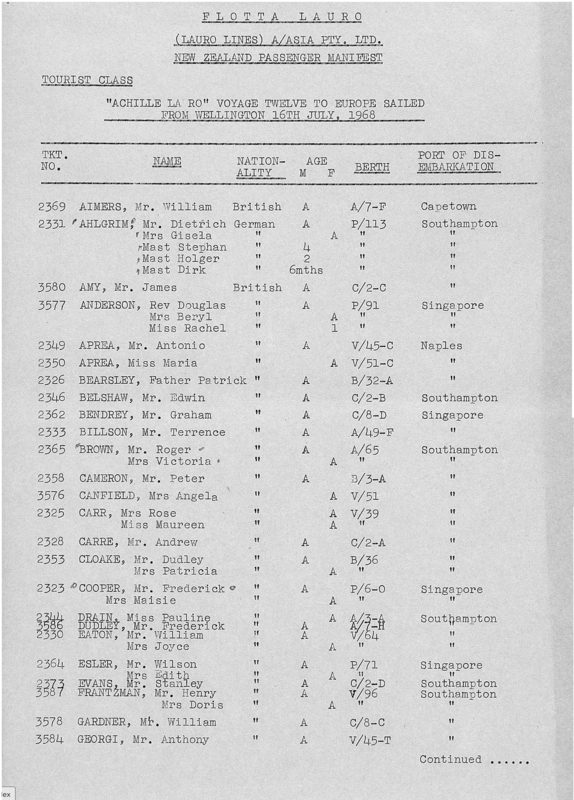 It had a photo of the original Achille Lauro passenger manifest from 16th July, 1968. We all stayed in berth P/113. My brothers are listed at 4 and 2 years of age and I was 6 months old. Thanks to the internet, documents like these still exist and some people took the time to scan them in. Personally I blame this trip that I never get sea sick, no matter what weather conditions I am in. I have been on boats in big storms, with gigantic waves, with people throwing up all around me, and I never got sick once. Even on one scuba dive I had divers throwing up into their respirators because of the moving current underwater. I was the only one sad that we had to skip the second dive. It could be a result of being on that ship for six weeks, throwing up enough for the remainder of my life. So what has this all to do with photography? Not much, or maybe a lot. As I do once or twice a year, I looked into my “Life Box”. A cardboard box that contains letters, photos, artifacts that I have collected throughout my life. Since I couldn’t find much online I searched my box for images of my dad. At a time when every person gets photographed hundreds of times a year with at least 20 every-pore-capturing megapixels, it is strange to have only a handful of photos of someone who lived before the digital revolution. Evidence of someone’s existence is rare and those pieces that remain and tell a story are precious. As blurred, faded, unfocused as they are, they seem to have more value to me than most crystal-clear images that pile up on my hard-drives. QM2 leaving the Harbor. Leica SL test drive.